Please note: The price you see is for one inner or end section. This is a heavy duty item designed and approved for use on highways. Strong and durable trench cover / Road plate. Made from durable composite material, supplied with strong flexible edges that ensure a flush fit to the adjacent ground. The Flexi-Edge system decreases trip hazards and decreases noise as vehicles mount and dismount the trench cover. Each inner section comes complete with a unique locking system underneath that consists of a number of pins that drop down against the edges of the trench. Each unit can be easily lifted and installed by two people. Even quieter in operation than our standard road plates, these are ideal for use in residential areas. Designed for use with 44tonn HGV's, independently tested to withstand prolonged heavy duty traffic. Supplied with reflective markings to ensure each unit is visible even at night. Ramped Design slows site traffic to increase safety. How are these fixed to the ground? 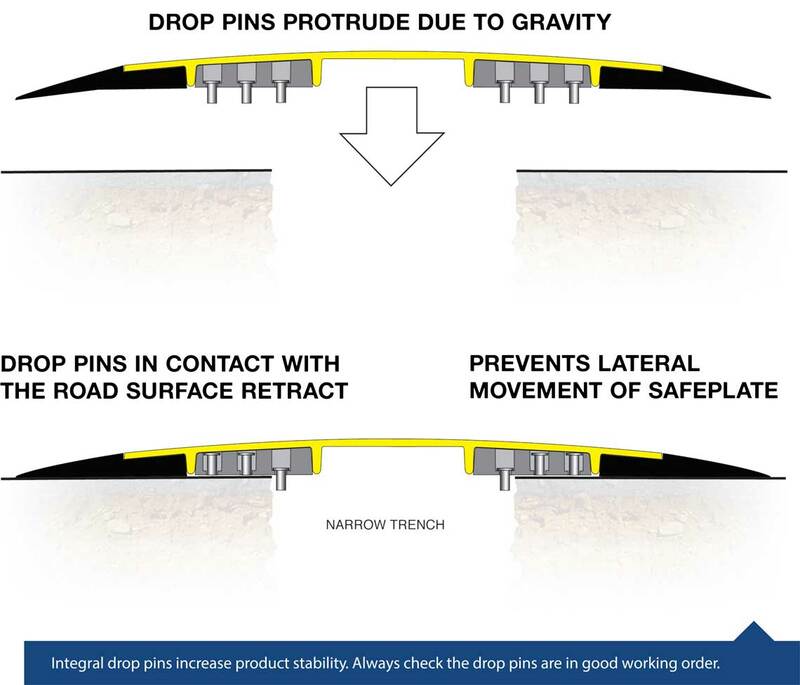 The unique locking system consists of blocks and pins, as shown the pictures below. Each inner segment comes complete with 3 x Pin Blocks and 14 x Pins - two blocks with 6 x pins and one block with 2 x pins. Additional blocks and pins can be purchased if required. Although these are commonly called "plastic road plates" they are actually made from a composite fibreglass material. They ended up being called plastic road plates as an easy way to distinguish them from traditional metal road plates.